I’ll be writing about this in more depth over the coming weeks, but for the benefit of you and all the Podcamp NH attendees I’d like to share my slides and related links from my Winning the Location-Based Services Game session. Winning the Location-Based Services game – Much has been said, tweeted and blogged about foursquare and Location-Based Services. 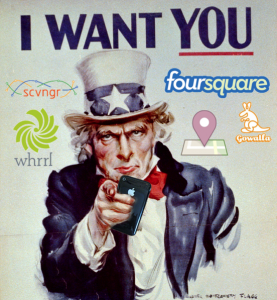 But what exactly are Location-Based Services and what can you do with them? Why does it matter and what does it mean to win at them? In this session we’ll explore and discuss the different ways we can make Location-Based Services like foursquare work for us, from both consumer and business/marketing perspectives, so we can all become winners of the game. Please feel free to re-use any imagery/slides/etc from this presentation (and please leave a comment and link back to me because I’d love to know!). If you check the attribution slides you’ll notice that most images are creative commons licensed by their original authors with the following exceptions: The “On a boat” pic, the check in on foursquare to donate $10 poster, the Jimmy Choo contest, the Radioshack checkin screenshot, A winner is you, and also the happy lolcat dog. So keep that in mind.